At the invitation of State Councilor and Foreign Minister Wang Yi, Ghana's Minister for Foreign Affairs and Regional Integration Shirley Ayorkor Botchwey will pay an official visit to China from June 10 to 15. Q: On June 7, Afghan President Ashraf Ghani announced a temporary ceasefire with the Taliban from June 12 to 20 as a way to implement a fatwa issued on June 4 by the Afghan Ulema Council. President Ghani in February proposed peace talks with the Taliban with no strings attached. What is your comment? A: China commends this announcement by the Afghan government on having a temporary ceasefire with the Taliban. China never believes that military options will help solve the Afghan issue. We hope that all parties in Afghanistan could make concerted efforts to launch peace talks as soon as possible and commit themselves to peace and stability in Afghanistan. China firmly supports the "Afghan-led and Afghan-owned" reconciliation process and will continue to play a constructive role in that regard. Q: The bill under deliberation by the Australian Parliament on countering foreign interference now has support from both sides of the Australian politics. And it will likely be passed into law within weeks. Do you believe that this legislation specifically targets China and does this legislation have any bearing on whether China will agree to the Australian Foreign Minister's visit to China? A: Does this legislation you mentioned explicitly say that it is directed at China? Reporter: Australian Prime Minister Turnbull has previously mentioned China in the early days of introducing the legislation into debate. But the legislation itself does not mention China. A: China's position is very clear. We develop ties with other countries following the principle of mutual respect and non-interference in others' domestic affairs. We hope that all countries could cast away the Cold-War and zero-sum game mentality and carry out friendly exchanges and cooperation on the basis of equal treatment and mutual respect. As for visits by any Australian senior official or leader, China has made its position clear many times. 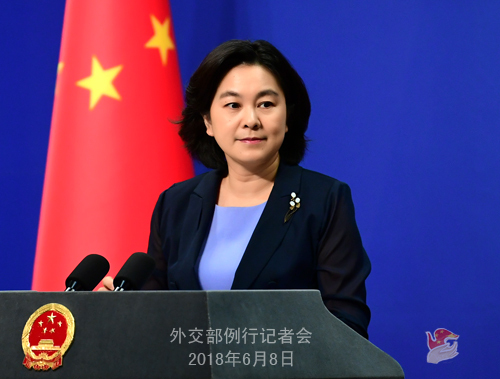 In principle, China would like to conduct exchanges and cooperation with other countries following the spirit and principle of equality and mutual respect. As for the specific visit you asked about, I have no information on that at present. Q: A statement by the Ethiopian People's Revolutionary Democratic Front, the governing party of Ethiopia, on June 5 said it would fully accept and implement the 2000 peace agreement with Eritrea as well as the ruling made by the Ethiopia-Eritrea Boundary Commission (EEBC) over border demarcation. What is your comment? A: China hopes that Ethiopia and Eritrea could properly resolve their dispute through dialogue and consultation and normalize their relations. We welcome the statement made by the Ethiopian side. Both Ethiopia and Eritrea are our friendly partners. China stands ready to work with the international community and continue to play a constructive role in promoting peace, stability and development for the Horn of Africa. Q: On the eve of the Qingdao Summit, Russian President Putin has arrived in China for a visit. What will be discussed between the two sides? What does China expect to achieve from this meeting? A: We have talked about President Putin's attendance at the Qingdao Summit and his state visit to China. This is President Putin's first state visit to China since his re-election and also the first meeting between the two heads of state in 2018, marking a core event for bilateral relations in the first half of this year. This afternoon, President Xi Jinping will hold large-group and small-group meetings with President Putin. The two presidents will jointly meet the press and attend signing ceremonies and welcoming banquets. The two sides will also sign and issue important political documents, summarizing and making plans for bilateral relations and specifying the principle, goals and priorities for China-Russia relations and all-around cooperation for the time being and in the near future. We believe that President Putin's visit fully demonstrates the high level and uniqueness of the China-Russia Comprehensive Strategic Partnership of Coordination and will achieve fruitful outcomes amid cordial and friendly atmosphere, thus providing strong impetus to the development of bilateral ties and all-around cooperation. Besides the official events, President Putin's state visit also has other highlights. So please keep following his state visit, and we will also release relevant information in a timely fashion. 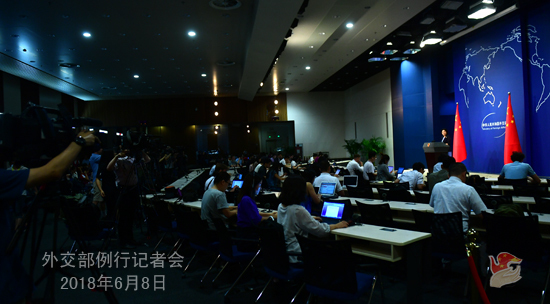 Q: What is China's expectation for the Iranian President's upcoming visit and his attendance at the SCO Summit? What will be discussed during the leaders' meeting? A: Iran is an observer state of the SCO. At the invitation of President Xi Jinping, Iranian President Hassan Rouhani will pay a working visit to China while attending the SCO Qingdao Summit. The two heads of state will have an in-depth exchange of views on bilateral relations and international and regional issues of mutual interest. Since the establishment of the China-Iran Comprehensive Strategic Partnership in 2016, exchanges and cooperation between the two countries have been moving forward on all fronts. China would like to work with Iran and take President Rouhani's visit as an opportunity to strengthen bilateral cooperation on the Belt and Road Initiative and steadily move forward China-Iran relations. Q: Reports say that Myanmar's government is reviewing the Kyaukpyu deepwater port project backed by China. Sources said that Myanmar's economic officials were looking for ways to negotiate down costs for the planned port. Some are concerned that it could ultimately fall under Beijing's control if Myanmar were to default on its debt. What is your comment? A: China and Myanmar are friendly neighbors, and we have been conducting close economic and trade cooperation. As far as I know, the Chinese company took part in the project through international bidding, and the two sides are now in business negotiations. We support the Chinese company and the Myanmar side in developing the Kyaukpyu port project in accordance with the principle of equal consultation, mutual benefit and win-win outcomes so as to promote the local economic and social development and improve people's livelihood. Q: The US side said that the symptoms displayed by the US Consulate General staff in Guangzhou because of the so-called sonic waves are similar to what their diplomatic staff experienced in Cuba. Has the US side informed China of this case officially? Is China still investigating this case? A: I gave my answer to the relevant question yesterday. As for the previous report that US diplomatic staff stationed in China were allegedly affected by the so-called sonic waves, the relevant Chinese authorities have carried out serious investigation and informed the US side of the result. By far, we have found no reason or clue that would lead to the situation reported by the US side. 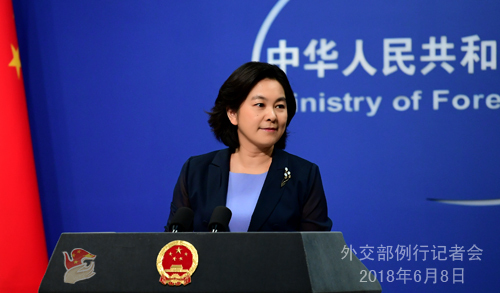 China will ensure the safety of foreign diplomatic staff in China, including those from the US, in accordance with the Vienna Convention on Diplomatic Relations and the Vienna Convention on Consular Relations. If the US side has any new information or leads, they are welcome to share with us, and we will make further investigations. Q: Will the Korean Peninsula nuclear issue be discussed at the upcoming SCO Summit? What diplomatic efforts has China made when the DPRK-US summit is just around the corner? A: All parties are closely following the Korean Peninsula nuclear issue, and there are also adequate channels for the parties concerned to communicate and talk about it. We hope that the upcoming SCO Qingdao Summit could focus on the theme of the summit as well as practical cooperation in various fields under the new circumstances and carry forward the Shanghai spirit so that the Qingdao Summit will inject new vitality into the SCO. Regarding the DPRK-US summit, we have noted that recently the US and the DPRK have made positive progress in preparing for the summit. We hope that the summit could be held as scheduled and achieve positive outcomes and more steps can be taken in the direction of politically resolving the Korean Peninsula nuclear issue. China will continue with its positive and constructive role in promoting the political settlement of the Korean Peninsula nuclear issue. Q: On June 8, China and Japan will launch the maritime and air liaison mechanism. The two defense ministries will be able to have direct calls via the hot-lines to avoid conflicts and hold regular meetings. What is your comment? A: China and Japan share the same goal when it comes to crisis management in the East China Sea. It is of great importance for the two sides to establish and launch such a mechanism in the sense of managing crisis on and above the sea and preserving regional peace and stability. China-Japan relations have been put back on the right track. We attach importance to the positive messages that have been sent out by Prime Minister Abe and the Japanese government on improving ties with China. We hope that Japan could continue to work with China in the same direction and consolidate the momentum to improve bilateral ties with concrete measures so as to usher in a new prospect for China-Japan relations.